Hi, my name is Hibiki and I’m doing an internship at Evergreen Outdoor Center in Hakuba. 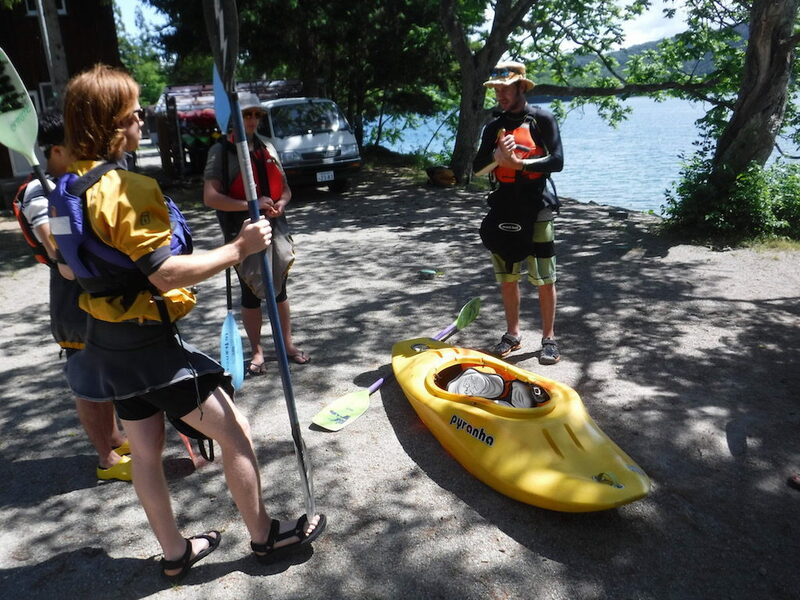 On June 12th, all the Evergreen’s trainees had kayak training, and they have to go through three days of the Evergreen’s kayak training to become a junior kayaking guide. On the first day of the training, we learned basic skills of kayaking and practiced those skills. The skills we learned were forward stroke, sweep stroke, and reverse stroke. Forward stroke is one of the fundamental paddling skills that you need to move the kayak forward. Sweep stroke like drawing a half circle to the side of the kayak to make it turn. 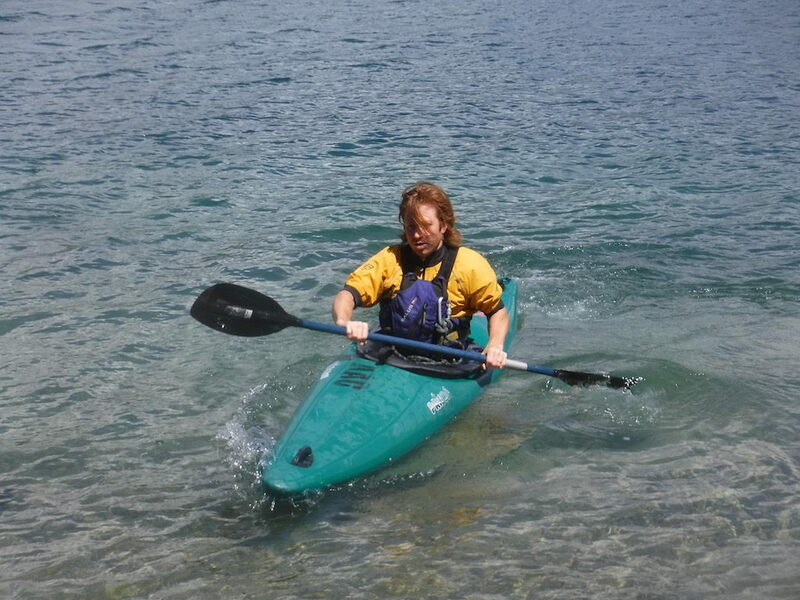 Reverse stroke is to push water at the back side of the kayak to move backward. I practiced those strokes, and it was not difficult to go forward by forward strokes, to make turns by sweep strokes, and go backward by reverse strokes. However, the one difficult thing was to go straight. Winds, waves, and stokes change the kayak’s direction, so when I did forward strokes, and I thought my kayak was going to go forward, I didn’t go straight because of those factors. Kayaking looked so easy, but it was really difficult to control a kayak and to go where you want to go. Jaja, the trainer of the kayak tour training, gave us some advice that “when the front of a kayak is turning left, you need to do sweep stroke at the left side of the kayak to make a small right turn, vice versa.” After we got this advice, we improved our paddling skills and were able to go straight. Kayaking on a lake looks so easy, but it actually requires you to paddle correctly and think about natural factors in order to enjoy kayaking. When you kayak, you need to use not only your body but also your mind to plan your strokes and maneuver your kayak. I want customers to enjoy kayaking, I need to be able to give correct and clear advice to them. I think from this training that I want to become a Junior kayak guide who can give customers clear advice and help them enjoy kayaking in this season. Evergreen offers not only the kayaking tours but also the canoe tours, the SUP (Stand Up Paddleboard) tours, and the firefly canoe tours at Lake Aokiko! If you are interested in any of the tours, please check the link below! We are waiting for you to come to Evergreen. I know you will have a great time in Hakuba.